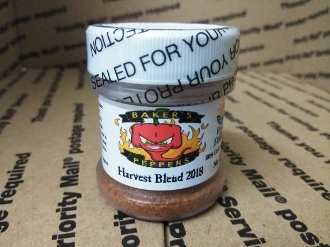 This ONE OF A KIND Nuclear Hot Gourmet Chili Powder Blend is called Baker's Harvest Blend 2018! This particular NUCLEAR HOT blend is unique to us at Baker's Peppers and can only be found RIGHT HERE!! :) We decided on the name of this blend as it contains OVER 40+ different varieties of peppers that we grew in 2018!! Below is a list of the different varieties in this blend. Most of the varieties found in this BRAND NEW blend are varieties so brand new and cutting edge that most people havent even heard of them yet..... You heard me right ChiliHead community... We have what you have been looking for right HERE!! The die-hard pepper heads LOVE this type of stuff!!!! :) We grow and produce EVERY ounce of peppers ourselves that is used to make this blend! We also harvest them by hand! We hand de-stem them, hand split them, and then dehydrate the peppers in small batches. This process is KEY in preserving the flavors and colors found NATURALLY in the peppers! The end result? Only the finest GOURMET chili pepper powder on PLANET EARTH!! We present to you a finished product that contains a whole years worth of hard work & dedication, a whole lotta Florida sunshine, and mother nature at her HOTTEST.... IN EVERY BOTTLE! Baker's Harvest Blend 2018. A Gourmet chili pepper powder blend you WILL NOT find any where else on the PLANET! We guarantee it!